The first part of this series explored Python by creating a simple dice game. Now it's time to make your own game from scratch. In my first article in this series, I explained how to use Python to create a simple, text-based dice game. This time, I'll demonstrate how to use the Python module Pygame to create a graphical game. It will take several articles to get a game that actually does anything, but by the end of the series, you will have a better understanding of how to find and learn new Python modules and how to build an application from the ground up. Before you start, you must install Pygame. Both methods work well, and each has its own set of advantages. If you're developing on Linux or BSD, leveraging your distribution's software repository ensures automated and timely updates. However, using Python's built-in package manager gives you control over when modules are updated. Also, it is not OS-specific, meaning you can use it even when you're not on your usual development machine. Another advantage of pip is that it allows local installs of modules, which is helpful if you don't have administrative rights to a computer you're using. If you have both Python and Python3 installed on your system, the command you want to use is probably pip3, which differentiates it from Python 2.x's pip command. If you're unsure, try pip3 first. The pip command works a lot like most Linux package managers. You can search for Python modules with search, then install them with install. If you don't have permission to install software on the computer you're using, you can use the --user option to just install the module into your home directory. pygame_cffi (0.2.1)            - A cffi-based SDL wrapper that copies the pygame API. Pygame is a Python module, which means that it's just a set of libraries that can be used in your Python programs. In other words, it's not a program that you launch, like IDLE or Ninja-IDE are. Your background is only an image or a color. Your video game characters can't interact with things in the background, so don't put anything too important back there. It's just set dressing. 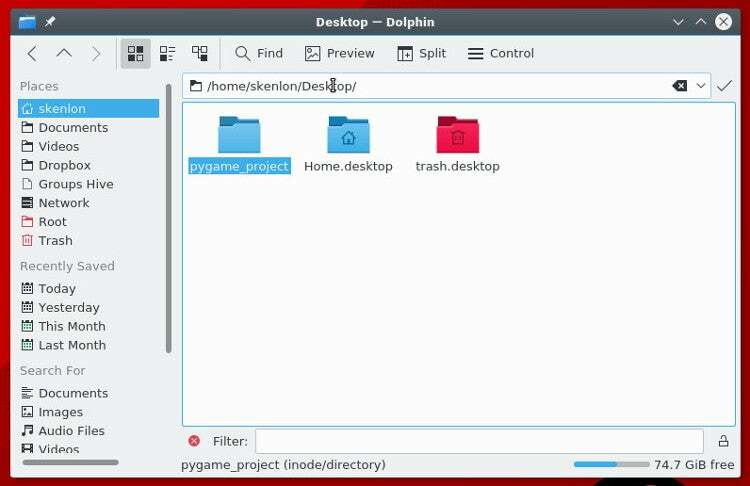 To start a new Pygame project, create a folder on your computer. All your game files go into this directory. It's vitally important that you keep all the files needed to run your game inside of your project folder. # along with this program. If not, see <http://www.gnu.org/licenses/>. Then you tell Python what modules you want to use. Some of the modules are common Python libraries, and of course, you want to include the one you just installed, Pygame. Since you'll be working a lot with this script file, it helps to make sections within the file so you know where to put stuff. You do this with block comments, which are comments that are visible only when looking at your source code. Create three blocks in your code. Next, set the window size for your game. Keep in mind that not everyone has a big computer screen, so it's best to use a screen size that fits on most people's computers. There is a way to toggle full-screen mode, the way many modern video games do, but since you're just starting out, keep it simple and just set one size. The Pygame engine requires some basic setup before you can use it in a script. You must set the frame rate, start its internal clock, and start (init) Pygame. Now you can set your background. Before you continue, open a graphics application and create a background for your game world. Save it as stage.png inside a folder called images in your project directory. There are several free graphics applications you can use. Krita is a professional-level paint materials emulator that can be used to create beautiful images. If you're very interested in creating art for video games, you can even purchase a series of online game art tutorials. Pinta is a basic, easy to learn paint application. Inkscape is a vector graphics application. Use it to draw with shapes, lines, splines, and Bézier curves. You also must define a color to use. In your setup section, create some color definitions using values for red, green, and blue (RGB). At this point, you could theoretically start your game. The problem is, it would only last for a millisecond. To prove this, save your file as your-name_game.py (replace your-name with your actual name). Then launch your game. 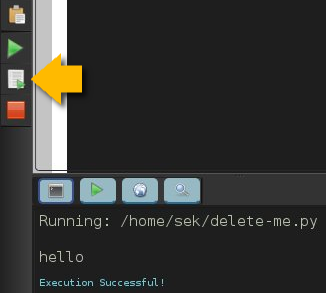 If you are using IDLE, run your game by selecting Run Module from the Run menu. If you are using Ninja, click the Run file button in the left button bar. You can also run a Python script straight from a Unix terminal or a Windows command prompt. However you launch it, don't expect much, because your game only lasts a few milliseconds right now. You can fix that in the next section. Unless told otherwise, a Python script runs once and only once. Computers are very fast these days, so your Python script runs in less than a second. To force your game to stay open and active long enough for someone to see it (let alone play it), use a while loop. To make your game remain open, you can set a variable to some value, then tell a while loop to keep looping for as long as the variable remains unchanged. Also in your main loop, refresh your world's background. Finally, tell Pygame to refresh everything on the screen and advance the game's internal clock. Save your file, and run it again to see the most boring game ever created. To quit the game, press q on your keyboard. In the next article of this series, I'll show you how to add to your currently empty game world, so go ahead and start creating some graphics to use! * Don't align comments, equals signs, brackets or anything else for aesthetics. * Comments on the same line as code should be preceded by two spaces. * When using multi-line comments, use double quotes rather than single, even if you're using single quotes for strings. * Spaces go after commas. * In conditional expressions (e.g. the while loop condition) don't explicitly test for equality with `True` (`while main == True`); instead, just do `while main`. If you absolutely need to test that something is `True` rather than truthy, do `while main is True` (identity comparison instead of equality). * Don't use the semi-colon to include multiple statements on one line. Hey, thanks. I'll get that fixed. Cheers! Thanks for providing this information. Can we intergrate some Machine Learning or Deep Learning in this framework for the Game Development. Thanks for the article. I tried and followed all the steps but I am unable to get anything. Can you please provide a complete script with what goes into Object, Set up and else where.